Welcome to Broomsticks and Owls, dedicated to our hero, Harry Potter. We hope you will enjoy your visit to this fan site and will want to return time and again to find out the latest news about Harry Potter, plus all the best merchandise and collectibles including games, T-shirts, posters and collectible characters plus much more stuff too. And don't forget to visit our Harry Potter Forum message board where you can even share your views, opinions, rumors and more with our fabulous and friendly Broomsticks and Owls forum members. An newly discovered, rare jungle flower has been named after a Harry Potter spell. The new species, Macrocarpaea apparata, is named after the term, to "apparate", used in J.K. Rowling's books. Lena Struwe, assistant professor of ecology, evolution and natural resources at Rutgers' Cook College is a fan of the Harry Potter series, and has been exploring Andes region in southern Ecuador with Jason Grant of the Université de Neuchâtel in Switzerland. The plant belongs to the Macrocarpaea genus of the gentian family of plants. Whilst driving through misty mountains and lush vegetation, Struwe and Grant suddenly spotted strange plants growing by the roadside, which, whilst looking like they were Macrocarpaea, had none of the usual characteristic of gentians. In order to confirm that it was a gentian, they needed to find a plant with flowers. Struwe explained that as night approached, the botanists were on the verge of giving up, when finally the found what they were seeking. "At the very last moment, a tall flowering plant suddenly, almost magically appeared in front on us," she said. Grant explained that "It was a small tree, 12-15 feet tall, full with yellowish-white, bell-shaped flowers adapted to nocturnal pollination by bats and moths". The flowers emerged only as darkness fell, almost as if they were an apparition. Inspired by this, Struwe and Grant decided on the species name, "apparata". Their research is described in the June 27 2003 issue of Harvard Papers in Botany [8(1): 61-81, 2003]. The word muggle is to become a dictionary word and will appear in the next edition of the Oxford English Dictionary. The dictionary is being updated for only the third ever time in its 146 year history, at a cost of £34 million UK pounds. Inclusion of a word from a living author of fiction is very rare. Other writers such as JRR Tolkien and CS Lewis had died before words such as Hobbit and Jabberwocky were included. A spokesperson for the Oxford English Dictionary said "The worldwide popularity of JK Rowling's fiction led to the word gaining a wide currency with English users throughout the world", and stated "It normally takes some time before a word starts to be used outside of its fictional context but with muggle this seemed to happen quite quickly." The entry will read: "Muggle (noun): In the fiction of JK Rowling, a person who possesses no magical powers. Hence in allusive and extended uses, a person who lacks a particular skill or skills, or who is regarded as inferior in some way." Many congratulations to JK Rowing and husband, Dr Neil Murray on the birth of their new baby on 23 March 2003. Their new son, named David Gordon Rowling, was born in Edinburgh, and weighed over 8 pounds. JKR has indicated that she may take some time off after giving birth. The Harry Potter and the Prisoner of Azkaban movie is intended to be released in Summer of 2004. A huge fire during the weekend of 22nd and 23rd February 2002, near a railroad bridge in Scotland where some of the movie scenes are being filmed, delayed production a little. The film is scheduled for Summer 2004 film release. The fire affected nearly 100 acres of scrub near the Glenfinnan Viaduct in north west Scotland. Filming was being done of the Hogwarts Express steam train making its way to Hogwarts School for Witches and Wizardry on the railroad bridge near the Viaduct, which was also the setting for one of the flying-car scenes in the Harry Potter and the Chamber of Secrets movie. It's been announced - the official release date for book 5, Harry Potter and the Order of the Phoenix will be 21st June 2003. Prepare for the big rush! Harry Potter and the Chamber of Secrets has been released in the movie theatres on 15 November 2002. Including Dobby, Aragog and the Whomping Willow amongst many other magical characters from the second book, it's a winner wth fans of all ages. Here's a tip from our forum - don't leave the cinema until the very end - there's a special extra scene after the credits featuring Gilderoy Lockhart! The Harry Potter and The Chamber of Secrets movie had its London premiere on 4th November 2002. Many of those lucky enough to have seen the film so far have said that it is even better than the first movie. Worldwide release is set for November 15th 2002. Actor Richard Harris who played Albus Dumbledor in the first two HP movies sadly died on 25 October 2002. He had been receiving treatment for Hodgkin's Disease, a type of lymphatic cancer, since earlier in the year, and died peacefully at University College Hospital in London at the age of 72. He starred in over 72 films, including playing King Arthur in Camelot. He will be sady missed by young and old alike, having gained a new fan base recently with his excellent portrayal as Albus Dumbledore. At the British Independent Film Awards on October 30th, a few days after his death, he was posthumously awarded a special prize for Outstanding Contribution by an Actor in remembrance of his long movie career. BroomsticksAndOwls share in the sadness of the loss of such a great actor. It's official - rumours of an 8th book are unfortunately untrue. Fans had been hoping that an 8th book might be a possibility when it was found that 3 more titles (as well as the forthcoming 5th book, Harry Potter and The Order of the Phoenix have been registered by Warner Bros as trademarks at the UK Patent Office. However, JK Rowling's literary agent, Neil Blair, has confirmed that the plan is to only have seven books in the series and that there is no truth in the rumours of a book 8. Following this news it is thought, therefore, that the three titles may simply be alternatives for the final two books, with one of the titles being a spare. The three titles which have been trademarked are Harry Potter and the Alchemist's Cell, Harry Potter and the Chariots of Light and Harry Potter and the Pyramids of Furmat. Previous news headlines and information can be found at our Harry Potter News Archive. Welcome to Hogwarts! Build a magical fantasy realm from the Harry Potter movies! 4 levels and the tower contain a potions room, a treasure room, the Mirror of Erised, and much more. 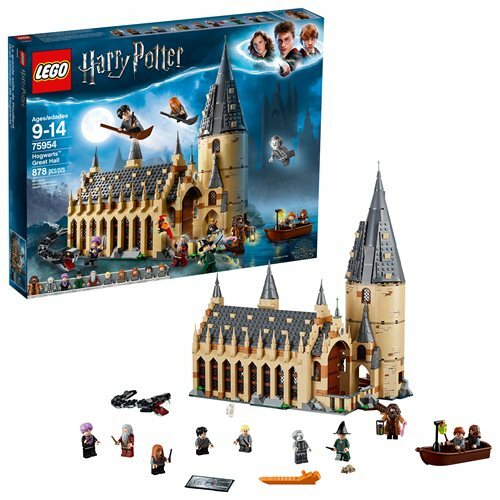 878 pieces include 10 mini-figures and buildable Basilisk and Fawkes creatures, plus Hedwig and Scabbers. Build a magical fantasy realm from the Harry Potter movies with this detailed 4-level LEGO Harry Potter 75954 Hogwarts Great Hall building kit. It features a fireplace, benches, tables, and reversible house banners, plus the Grand Staircase tower with a spiral staircase, potions room, treasure room, sorting hat, Mirror of Erised, and lots of magical artifact accessory elements. This fun role-playing castle toy includes 10 mini-figures and buildable Basilisk and Fawkes creatures, plus Hedwig and Scabbers figures! 878 pieces. Ages 9-14. 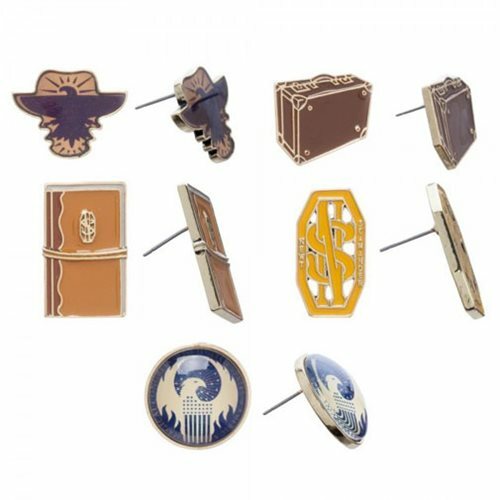 Documenting the travels of Newt Scamander global excursionist who houses an array of magical creatures in a briefcase like none other get ready to bring the greatest magical and muggle moments from the movie to walls instantly with this charmed wall decal pack. Experience the Magical Adventure; Follow the young wizard Harry Potter and his friends Ron Weasley and Hermoine Granger through their adventures at Hogwarts school of Witchcraft and Wizardry, in the complete series boxset; This set includes 16 discs. Harry Potter and the Philosophers Stone. The magical adventure begins when Harry Potter is invited to attend Hogwarts School of Witchcraft and Wizardry. Harry Potter and the Chamber of Secrets. Cars fly, trees attack and a mysterious house-elf warns Harry of great danger as he returns for his second year. Harry Potter and the Prisoner of Azkaban. Harry must confront soul-sucking Dementors, outsmart a werewolf and learn the truth about the escaped prisoner of Azkaban - Sirius Black. Harry Potter and the Goblet of Fire. Harry must overcome a deadly dragon, fierce water demons and an enchanted maze only to find himself in the cruel grasp of He Who Must Not Be Named. Not for individual resale. Lonely Planet: The world&apos;&apos;s leading travel guide publisher Lonely Planet Pocket Orlando & Walt Disney World(r) Resort is your passport to the most relevant, up-to-date advice on what to see and skip, and what hidden discoveries await you. See the iconic Cinderella&apos;&apos;s Castle at the Magic Kingdom, explore the Wizarding World of Harry Potter at Universal Studios, or ride roller coasters at the Islandsof Adventure; all with your trusted travel companion. Get to the heart of the best of Orlando and begin your journey now! Inside Lonely Planet Pocket Orlando & Walt Disney World(r) Resort : - Full-color maps and images throughout - Highlights and itineraries help you tailor your trip to your personal needs and interests - Insider tips to save time and money and get around like a local, avoiding crowds and trouble spots - Essential info at your fingertips - hours of operation, phone numbers, websites, transit tips, prices - Honest reviews for all budgets - eating, sleeping, sight-seeing, going out, shopping, hidden gems that most guidebooks miss - Free, convenient pull-out Orlando map (included in print version), plus over 17 color neighborhood maps - User-friendly layout with helpful icons, and organized by neighborhood to help you pick the best spots to spend your time - Covers Walt Disney World(r) Resort, Universal Orlando Resort, International Drive, Orlando, Loch Haven Park, Winter Park, Kennedy Space Center, Legoland, Gatorland and more The Perfect Choice: Lonely Planet Pocket Orlando & Walt Disney World(r) Resort, a colorful, easy-to-use, and handy guide that literally fits in your pocket, provides on-the-go assistance for those seeking only the can&apos;&apos;t-miss experiences to maximize a quick trip experience. - Looking for a comprehensive guide that recommends both popular and offbeat experiences, and extensively covers the whole region? Check out Lonely Planet&apos;&apos;s Florida guide. Or check out Discover Florida, a photo-rich guide to the region&apos;&apos;s most popular attractions. - Looking for more extensive coverage? Check out Lonely Planet&apos;&apos;s USA guide for a comprehensive look at all the country has to offer, or Discover USA, a photo-rich guide to the country&apos;&apos;s most popular attractions. Authors: Written and researched by Lonely Planet and JenniferDenniston. About Lonely Planet: Since 1973, Lonely Planet has become the world&apos;&apos;s leading travel media company with guidebooks to every destination, an award-winning website, mobile and digital travel products, and a dedicated traveler community. Lonely Planet covers must-see spots but also enables curious travelers to get off beaten paths to understand more of the culture of the places in which they find themselves. Newly added: Check out wonderfully designed Trunk sets and wonder at what they contain inside. Just think if you could have an accurate and detailed movie prop replica. Now it's finally possible! Take things up and away on your broomstick. Essential for Quidditch, these Brooms are modelled on those used by our magical friends for sport and flight though the air. Make any time of year a magical one with a Harry Potter Calendar. Enjoy the original strategy game from ancient times with a magnificent Wizard Chess Set. Re-create scenes from JK Rowling's magical books with fun and challenging Harry Potter Lego Sets. It's a magical time at any hour of day with a Harry Potter clock. Choose from attractive wall, table or alarm clocks. Enhance your home decor with attractive wall hangings. Each wall hanging features artwork the front cover of JK Rowling's books, and is perfect decor for wizards and fans of any age. Get your very own high quality official Harry Potter watch featuring our favorite wizard and Quidditch logos. Start the journey to Hogwarts School of Witchcraft and Wizardry from your own home with your very own Hogwarts Express Train set. Get the Harry Potter and the Chamber of Secrets video game, available for the UK, USA and selected international countries. Or Play Harry Potter and the Philosopher's Stone Video games on your PC, Apple Mac, Playstation or Gameboy. Plus younger fans can enjoy creating virtual characters to populate Hogwarts Castle, scenes and locations from the books and movie including the Hogwarts Express train track, using the Lego creator video games. Ensure a comfortable and peaceful night's sleep full of wonderful magical dreams with fabulous Harry Potter bedding items. Stay dry in the rain with a fashionable Harry Potter umbrella. Available for in both adult and child's sizes, these fabulous umbrellas will protect you from bad weather at any time of year. Buy your very own copy of the Harry Potter and the Philosopher's Stone DVD or video, featuring previously unseen footage not shown in the cinemas. Harry Potter Trading Cards make great collectibles and a highly enjoyable game too! Posters to brighten up any wall. Useful items which will be treasured for a lifetime, Harry Potter cookie jars and Bertie Botts candy jar gifts will enable fans to keep their tasty goodies together. Collectible Figurines of your favorite characters, each complete with its own individual story scope. Board and Electronic Games including a Deluxe Scene It? Harry Potter DVD Game plus Goblet of Fire Triwizard and Quidditch games. Experience the satisfaction of piecing together some fantastic pictures with these fun and mentally stimulating jigsaw puzzles. Whether you're a muggle or a wizard, you can enjoy your drinks in these great mugs featuring the stars of J.K. Rowling's books. Harry's mail owl Hedwig, Ron Weasley's rat Scabbers and all your favorite HP characters are looking highly cute in the form of Harry Potter soft plush toys and stuffed animals. Get into the fashion of Hogwarts and the Wizard world with stylish Harry Potter clothing including polo shirts. These fashionable items are perfect gifts for everyday wear. Combine fashion, and comfort in Hogwarts style with Athletic Shoes for all your running and leisure needs. Younger fans can have fun dressing in Harry Potter robes and costumes including their very own Sorting Hat. With these fabulous costumes, and their very own wand, their imagination will instantly transported them to the magical world of Hogwarts School of Witchcraft and Wizardry. Share your views, ideas and rumours in our Harry Potter Forum .